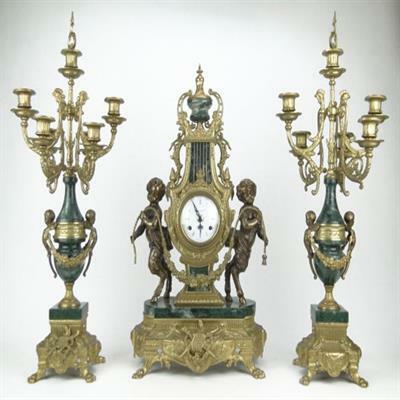 20Century Italian bronze and marble garniture clock set. The Clock Case is topped with Bronze & Marble Urn Flanked by Satyrs Holding Garland Strands. Theclock is made by Hermley & Sonene of Germany .This is accompanied by 7 Light Marble & Bronze Candelabrum Each Candelabrum is 27 Inches tall. The clock is 24 inch tall . The clock is in perfectworking condition.